We millennials are a different generation when it comes to money and investing. We grew up in the face of two huge economic events: the tech bubble and the housing crisis. We grew up in a decade of war overseas. And we have been growing up in a world of increasingly polarized news — it’s the news, spun how you want it to be. All of these things have us investing in a different way than our parents, and a recent UBS study confirms it. Conservative and risk-averse, holding more cash than previous generations. Savings and budgeting is what creates wealth, not investing. Worried about helping parents whose portfolios have been impacted by market events. A distrust for TV, online, and social media personalities when it comes to investing and money management. But the fact is, millennials need to invest because long-term investing in the stock market is one of the best ways to grow wealth over time. I’m fearful that too many millennials are simply going to save, and then wake up at 65 with a small nest egg and wonder what happened. We need, as a generation, to take in the events that have happened, but craft a strategy around them that will enable success over the long-term. Here’s what I’m talking about. There is a great thing about holding a lot of cash and feeling comfortable for today: you only will feel safe and comfortable today. If you invest too conservatively over the next 20 years, you’ll be faced with a problem that I’ve talked about several times — and that’s coming up short on money in retirement. In my article How to Invest If You Don’t Make Much Money, I shared the story of my friend’s mom who just saved all her life. She had a 401(k) at her company, but kept all of her investments in the “Stable Value” fund because she didn’t want to lose any money. She was too fearful of losing. The problem was, after 30 to 40 years of savings/investing, she only had about $300,000 in the account. The money just never grew beyond the 1% the Stable Value fund paid. So, her money didn’t work for her. And guess what? She was now faced with having to work for as long as her body could hold up — 70 or beyond. She had to wait until 70 to get the largest Social Security payment possible, since her own savings could support her. How do you think she felt? Heartbroken. It’s sad that she hadn’t simply made different investment choices 20 years earlier. The truth is, saving and budgeting alone won’t help you reach your financial goals, and anyone who tells you otherwise is not telling you the entire story. Yes, saving and budgeting can help you, but they aren’t the answer. You need your money to grow! You need your money to work for you. Or, you need to earn more money. I’ve shared with you how you can change the math on living on half your income. I show you how there is more to just saving half your income — you can also boost your earnings. That is also why we talk about the six income streams you need to set up in your 20s. Combining these two strategies is the start of a solid financial plan that will enable you to succeed over the long-term. But at the end of the day, millennials will still need to invest. So, you can make more money and save more money — but saving money alone will not help you grow your money. You need to invest it, but you need to invest it in a way that is comfortable. 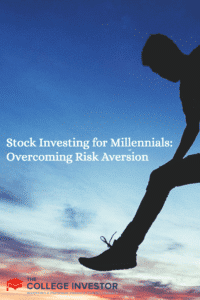 Here’s my breakdown of how millennials (and other risk-averse investors) can set up a portfolio that makes them feel comfortable. It’s a strategy that I use, and I know that it works. First, you need to have an emergency fund. If you don’t have one, get one. This is your cash pile. I recommend at least six months of expenses saved, but if you’re very cautious, there is no harm in having nine months or even a year. For example, if you want to start a business, having 12 months of cash can bring some financial peace of mind. Or, if you don’t work in a stable job, the bigger the cash pile, the better. So, if your expenses are $2,000 per month, we’re talking a minimum of $12,000 just in cash. Next, you need to take advantage of free money. This means maximizing any 401(k) matches that your employer offers. If you qualify for a 401(k) at work, you must do it. No exceptions. In this account, you need to invest in the stock market and let it grow over time. Yes, it will fluctuate, but it will grow over the long term. Finally, you need to invest yourself. This means investing in an IRA or traditional brokerage account. We’ve put together an easy and free guide on investing, and we also have free video training to help you get started investing. But, since most millennials don’t trust me . . . ask your parents how to get started! You need to invest — even if it’s only $100 per month. The power of compounding will help you grow your money over time! Now it’s your turn — what’s holding you back from getting started investing, or have you already taken the first step? I’ve read similar stories and have the same concern as you – that millenials will wake up when they are in their 50’s and kick themselves for not investing for the past 30 years. Investing does work, if you stick to it over the long-term. If you are jumping in and out of the market all of the time, you are going to fail miserably. But keeping your focus on the long road ahead and staying invested during both ups and downs is a winning strategy.